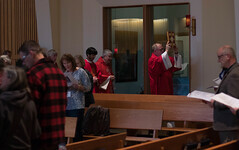 On October 1st, Bishop Edward J. Burns convoked the Second Synod of the Diocese of Juneau, the sessions of which will be held at the Cathedral of the Nativity of the Blessed Virgin Mary and the Church of Saint Paul the Apostle in Juneau, Alaska, on November 21-24, 2013, with the celebration of the Solemnity of Christ the King concluding the Year of Faith proclaimed by His Holiness Pope Benedict XVI. 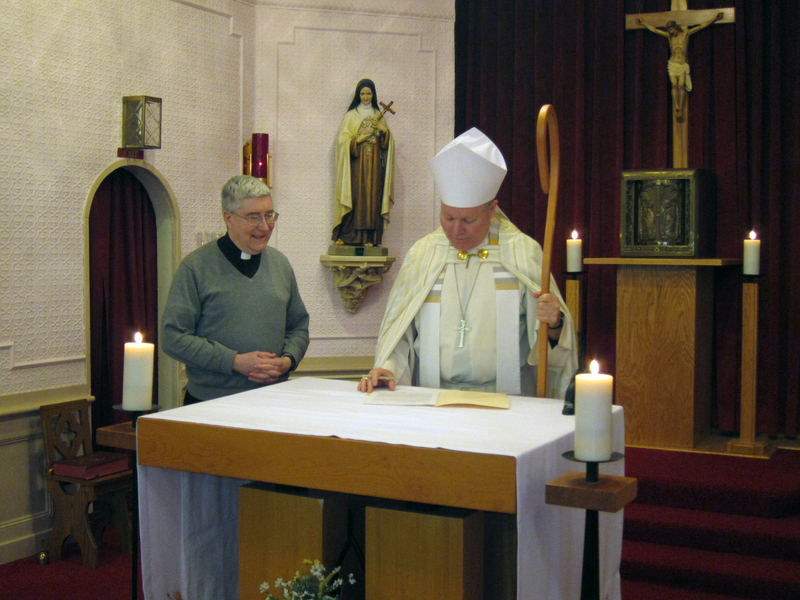 Bishop Edward J. Burns signs the Decree convoking the Second Synod of the Diocese of Juneau on October 1st, the Feast of St. Therese of Lisieux, at St. Rose of Lima Church in Wrangell. Fr. Pat Travers, Chancellor for the Diocese, witnesses the signing. Bishop Burns determined that the circumstances of the Diocese of Juneau suggest the desirability of a Diocesan Synod at this time for a number of reasons. The First Synod of the Diocese of Juneau took place twelve years ago during the Jubilee Year 2000 under his predecessor, Bishop Michael W. Warfel. While most of the resolutions of that Synod that were accepted for implementation by Bishop Warfel continue to be of great usefulness in the life of our Diocese, the circumstances of the Diocese have changed significantly since that time. A Preparatory Commission for the Synod under the guidance of Fr. Pat Travers will assist in conducting a Diocese-wide process of consultation. 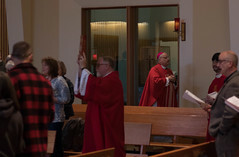 Bishop Burns stated his intention to personally visit each Diocese of Juneau parishes or mission for listening sessions in which it is hoped that members will participate actively. It will be on the basis of this process that the questions for deliberations by the Synod will be formulated and the information for those deliberations will be developed.